Milan Malpensa Airport (MXP) offers travellers to Milan a wide range of ground transportation and travel options to suit every passengers' needs in Italy. Serving Milan and the surrounding Lombardy area of Italy, travel and ground transport facilities at Malpensa Airport include buses, car rental, taxis and a range of airport train services, which operate at regular intervals. Malpensa Airport features fast and efficient Malpensa Express train services, connecting MXP Terminal 1 with the central Milan Cadorna railway station train and other stations en route. Operating every 30 minutes during the day, the Malpensa Express trains provide are an inexpensive way to travel between the city centre, with the journey lasting approximately 40 minutes. A local shuttle bus runs on an hourly basis, connecting MXP Airport's Terminal 2 with Gallarate railway station, with good links to the central railway station. Milan's Malpensa Airport is served by many regular public buses that depart from the terminal departures area and travel to various locations in and around Milan and Italy. Malpensa shuttle buses run to Milan Central Station at 20 minute intervals, between 06:20 to midnight. The journey by bus into the city centre lasts around one hour. There is also an additional bus service from the airport that travels to Milan Gallarate Station, operating every 20 minutes between 05:35 to 19:50 and a further shuttle bus that connects Malpensa (MXP) and Linate (LIN) airports at regular intervals throughout the day. Taxis are readily available and can be found in the designated taxi ranks close to the main arrivals and departures area of each MXP terminal building. 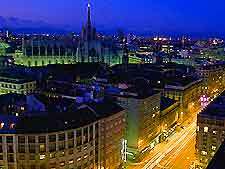 The taxis provide one of the most convenient and easy ways to travel into nearby Milan city and other nearby suburban areas of Italy, with reasonably price taxi fares. The journey into central Milan will take around 50 minutes, depending on traffic. Official MXP taxi cabs should be used at all times to ensure safety and also to avoid any possible overcharging.